Being stuck with thousands of useless boxes is a nightmare—that’s why we send you at least one free sample first so you can double-check your packaging’s sizing and design. Here’s how it works: After we receive your final packaging design file, we digitally print it and hand-make a full-color box sample according to your specified dimensions and style, which we then mail to you for your review. If everything looks great, let us know and we’ll move to finalize your order. If you find a typo or something similar, just tell us and we’ll send a modified sample! 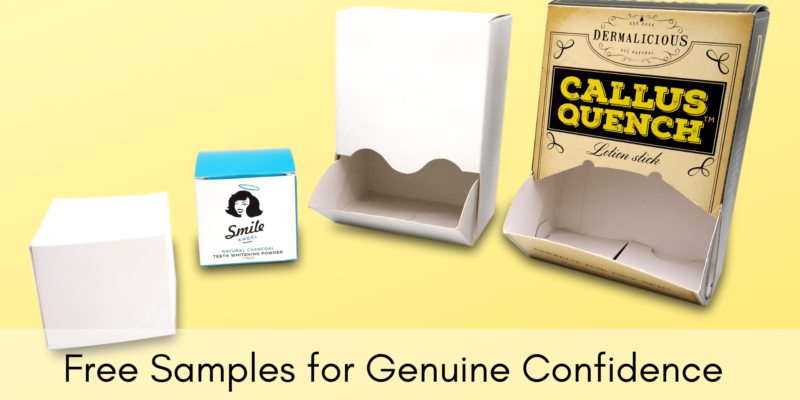 Want a sample even if your packaging design isn’t ready yet? We can send unprinted ones (as seen above) as well as your full-color samples when it’s time.